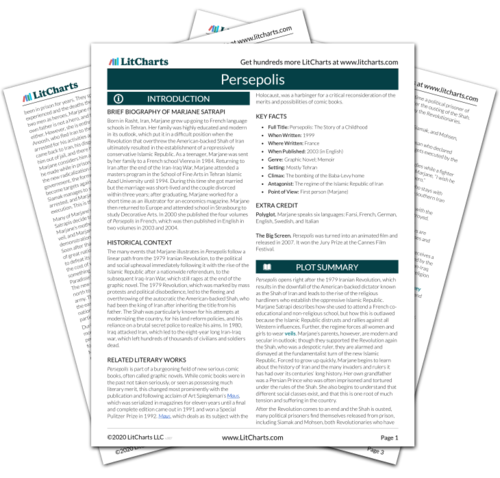 Instant downloads of all 946 LitChart PDFs (including Persepolis). 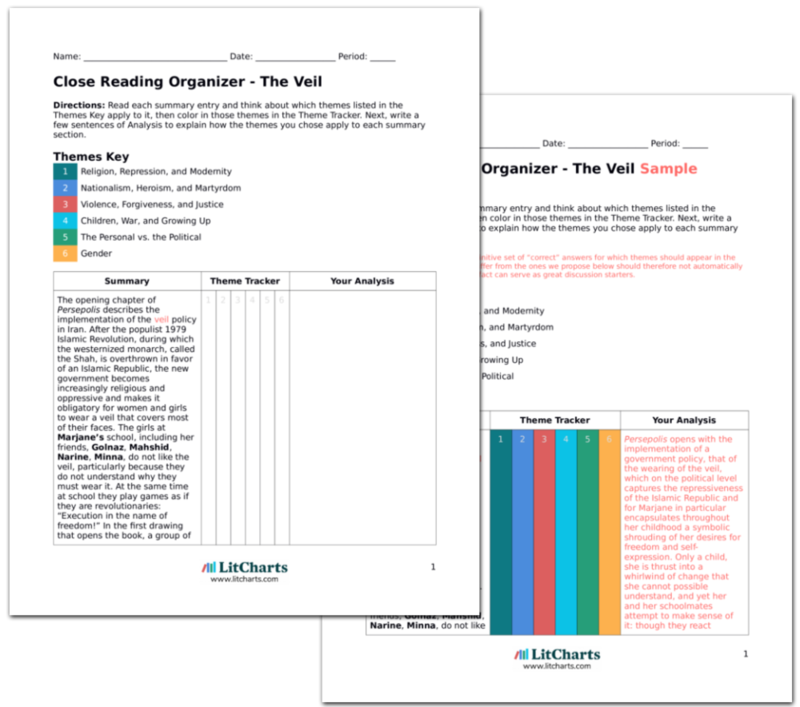 LitCharts assigns a color and icon to each theme in Persepolis, which you can use to track the themes throughout the work. A few days after the revolution succeeds, 3000 political prisoners of the revolution are liberated, among them Siamak Jari, the husband of Marjane’s best friend, and a long time political prisoner and friend of the family named Mohsen Shakiba. Marjane recalls how, before the release of the political prisoners, Laly, Siamak’s daughter, had visited Marjane’s family home. Marjane had told her that though her family was telling her that her father is on a long trip, really this means he is dead. Laly had run home crying, and Marjane was sent to her room. “Nobody will accept the truth,” she thinks. The end of the revolution brings a semblance of normalcy: those who were arrested have now been returned. However, Marjane remembers how she was sure that Siamak Jari was dead, and how she had tried to tell the truth to his daughter, who believed he was simply on a trip. Though Marjane demonstrates her alertness in not believing what is obviously false (though she was also wrong herself), she is not able to muster the maturity to allow another girl to believe a white lie. Further initiated into the macabre horrors of the revolution, Marjane is both fascinated and terrified by what she hears. This time, she wishes that her parents would protect her. Looking at the iron, she is struck by the ordinariness of the objects of torture; what she saw as an innocent object has now been turned into an object of inhumanity, something that was previously beyond her imagination or comprehension. Confusingly, Marjane’s mother seems to take back her mantra of forgiveness when she wishes for the killing of torturers. Moreover, Marjane feels jealousy towards Laly and her father, indicating how she still, childishly, romanticizes the war. Unable to compute the seeming contradictions within her family, she flees into the activity of childhood. Marjane starts playing a game with her friends where they make up various forms of torturer. “Back at home that evening, I had the diabolical feeling of power…But it didn’t last. I was overwhelmed.” Back home, Marjane runs and cries on Marjane’s mother’s lap, and her mother reassures her daughter by promising that the torturers “will pay for what they have done.” When Marjane brings up that she had thought her mother told her that one should forgive others, her mother explains: “Bad people are dangerous, but forgiving them is, too. Don’t worry, there is justice on earth.” At night, Marjane lies in her bed and feels safe in the arms God. Playing games becomes a defense mechanism for dealing with difficult information; by taking on adult torture in her childish games, Marjane diminishes the reality of the horror while allowing herself a sense of power. Still, playing is not enough to allay her trauma, and she runs to her mother and confronts her about the contradiction between forgiveness and punishing bad people. Marjane’s faith in God allows her to believe that there will be justice sometime. Goldman, Ben. "Persepolis The Heroes." LitCharts. LitCharts LLC, 26 Aug 2015. Web. 24 Apr 2019. Goldman, Ben. "Persepolis The Heroes." LitCharts LLC, August 26, 2015. Retrieved April 24, 2019. https://www.litcharts.com/lit/persepolis/the-heroes.